Members have built all kinds of steam locomotives and rolling stock in 7¼", 5", 3½", 2½" and smaller gauges, as well as 'diesel' hydraulics, battery electrics and other i.c. powered setups. The unique scale model on the left is a 7¼" gauge 0-4-4 coal fired Lancashire, Derbyshire and East Coast Railway loco built by our club president from scratch in the traditional manner. In contrast the powerful 7¼" gauge diesel outline battery powered Rio Grande loco (shown here on Santa Special duty) was built by two of our members using CAD drawings, laser cutting, CNC machining and electronics. Models are being built in several scales, e.g. a 1½" Allchin, a 2" Fowler showman's, a 4" scale Garrett, and others up to half full size. Club members have owned and operated full size steamrollers and traction engines. A 4" scale Foden steam lorry is also under construction. Unlike railway locomotives traction engines can be steamed up and operated whilst stationary, and used to drive model agricultural machinery. The Society operates a large scale garden railway, known as the Ecclesall Woods Light Railway with two separate tracks in 32mm and 45 mm gauges. Most locomotives are live steam narrow gauge outline and radio controlled. Some locos are battery powered. Look out for the colourful characters seen on the station platform from time to time - including Dad's Army! It's ok, it's a hot air engine! 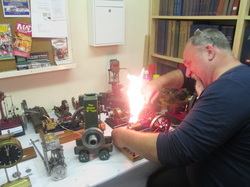 Our members have a substantial collection of stationary steam and hot air engines of all sizes and usually each year a special event is organised at which they are run under steam or compressed air. Some of these can be seen in this photo of one of our annual free exhibitions. A stationary engine can be built with a minimum of equipment, is easy to handle and to display. It is a good introduction to model engineering for a beginner. Kits and castings are readily available from Southworth Engines as well as other suppliers. Our members are interested in anything mechanical! We have members who build ships - steam or electrically powered, aircraft, and clocks. Steam engines constructed for full size launches are also classed as model engineering. One member is constructing a working miniature jet engine. Another built his own sports car. One operates a fairground organ for charity. We have visiting speakers during the winter who give talks on all manner of interesting subjects, including the very latest engineering breakthroughs as well as more traditional model engineering topics.